Today we took a trip to Tung Chung and the outlet mall there. I would highly recommend it to anyone who wants to get out of town and do a little shopping (because there’s not enough shopping in Hong Kong itself 😛 ). The reason we went there was to look for shoes for the little guy. 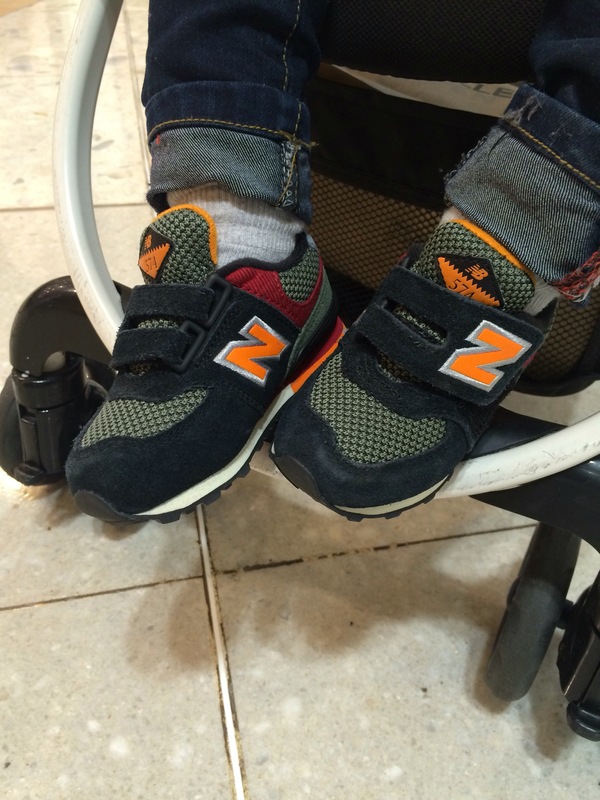 We had found some New Balance shoes at the kids stores in Ocean Center, but they were a bit more expensive than I wanted to spend. So, off we went to the mall. And there it was, the New Balance store. Damn! I looked in the window and those kids shoes are awesome! Not one pair, not two, but just about all of them looked cooler than mine. Next step, get into the tiny store and get a pair for him. Easier said than done. The shop is tiny. We went in, and I parked the little guy’s stroller in a spot where he could make a very small amount of damage (his reach is expanding!). And then I squeezed my way to the kids shoe area where the staff member insisted I did not touch anything but just tell him what I wanted. So I told him the size and squeezed my way back to the little guy. Then he came with the shoes. SWEET! He instantly fell in love with these things and insisted he try them on. Then, I let him out of the stroller and he walked in them and he laughed and tried to run around. So, we bought them (a good price! ), and left the store. He was already on his feet so he was walking behind me, and he insisted on taking the shoe out of the box and carrying it. Then he put it on the floor and tried to put it on. Then he cried until I put the shoes on him. On the floor. In the middle of the mall entrance. Awesome.